What is Radon and Should I Recommend Testing? Radon testing may not be the first thing you think of when going through the home buying process with a Client, but it is right up there in importance with home & termite inspections. 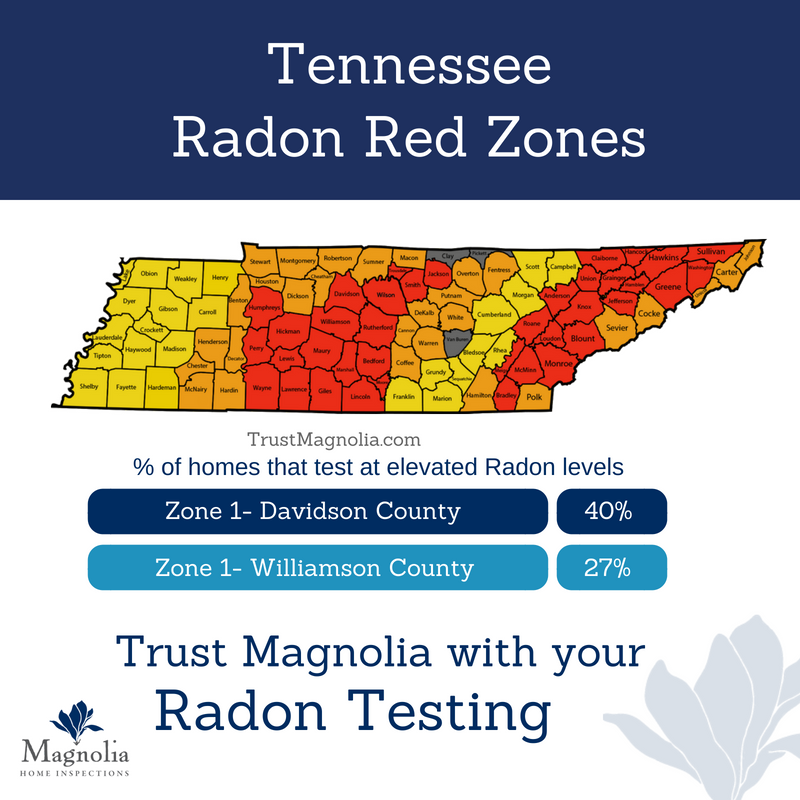 In Davidson County specifically, 39% of homes tested are found to have radon levels requiring mitigation. So Radon testing is one recommendation that is not only vital, but will show your Clients that you go the extra mile to make sure they’ll love and be SAFE in their new home. Radon is a colorless, odorless, radioactive gas produced by decaying uranium. Yes, it sounds like something from a Bond movie, but it’s the real deal. Even though we can’t see or smell it, it’s present in nearly all soils, some building materials. Low levels are even found in most water & the air we breathe. It enters houses through a variety of methods including gaps in walls & floors, areas interacting with soil, even through pores in the concrete. The problems arise when it becomes trapped inside a structure and the occupants are exposed long term. Radon levels found in everyday life are typically not harmful, but with home improvements, settling or damage, increasing construction, land development etc. radon levels can begin to rise. Individuals spending most of their time inside a structure with high levels of radon will eventually suffer the consequences of overexposure, including increased likelihood of lung cancer. The Surgeon General has warned that radon is the second leading cause of lung cancer in the United States today. Knowing this and considering the local radon rates, testing for radon here in Nashville is really a must. What to do if a radon test comes back to high? Don’t Panic! The risks from radon are cumulative, so serious effects present from exposure to high levels over a long period of time. Just because a property comes back with high levels of radon, you don’t need to pull the offer and forget about the home. Many radon issues can be resolved very easily and at a very reasonable cost. Your Home Inspectors at Magnolia Property Consultants are very knowledgeable and connected. We can give you some ideas to resolve it or refer you to a trusted local contractor for professional and thorough mitigation. Not only are our technicians professional and experienced, through our digital testing method, Magnolia provides same day results for Radon Testing! You can have your 48 hours testing completed and results in hand immediately, not weeks later. Magnolia uses Alpha Spectrometry, world-class app-driven technology with enhanced reporting and analysis capability to deliver the most accurate and consistent radon measurements with a streamlined process. How does it work? The measuring period is 48 hours with the testing materials onsite. Once the equipment is picked up after this period, we provide you with the results. So simple! Protect your liability as a Realtor – Is your home inspector AARST certified?